Hear about Ngarrindjeri's feelings for land and culture. View a midden site. Talk about burial grounds. We take groups out on field trips upon the land, and to the Southern and Northern ends of the Coorong, talking about places that are important to us. 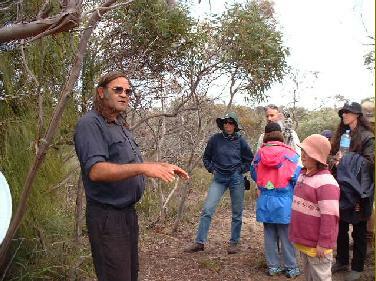 On this walking trail through Bonney Reserve you will see Ngarrindjeri Bush Tucker and Bush Medicine and talk about their uses. On this Field trip you will be able to cross the sand dunes to the Southern Ocean where you will view Ngarrindjeri Midden Sites. You will visit Chinaman's Well and discuss the history of the area, travel Old Melbourne Rd to view a Mallee Fowl nest and visit Jack's Point to view the Pelican Breeding Island. On this field trip you will travel along the Coorong and view the Stone Fish Traps made by the Ngarrindjeri people who lived here for thousands of years. You will visit Pelican Point and see the Barrages. Here we will discuss the impact these barrages have had on the environment and animal life. We will travel on to Raukkan (Pt Mcleay) where you will have the opportunity to have a look at the church that is printed on the $50.00 note, and discuss the Raukkan area and history.